Minister Duminda Dissanayake and Anuradhapura West SLFP Organiser W.B. Ekanayake at the event. Picture by Nimal Wijesinghe, Anuradhapura Additional Group Corr. Former President Mahinda Rajapaksa often said that even the smallest individual could rise to the top, but his words only prove to be contradictory as he was attempting to reclaim the throne as President, instead of supporting his brothers to achieve it, Irrigation, Water Resources and Disaster Management Minister Duminda Disanayake said. He said that in those actions, the former President only revealed his thirst for power. Minister Dissanayake was addressing an Anuradhapura West Electoral Board of Authority meeting convened by Anuradhapura West Sri Lanka Freedom Party (SLPF) Organiser W.B. Ekanayake, recently. The minister said the country knew that former President Rajapaksa was barred from contesting the Presidential elections since he had previously completed two terms. However, neither Gotabhaya nor Basil Rajapaksa was allowed to contest as they held dual citizenship. The stand of the Joint Opposition and Pohottuwa party concerning the next presidential candidate, had been controversial and questionable, Minister Dissanayake said. 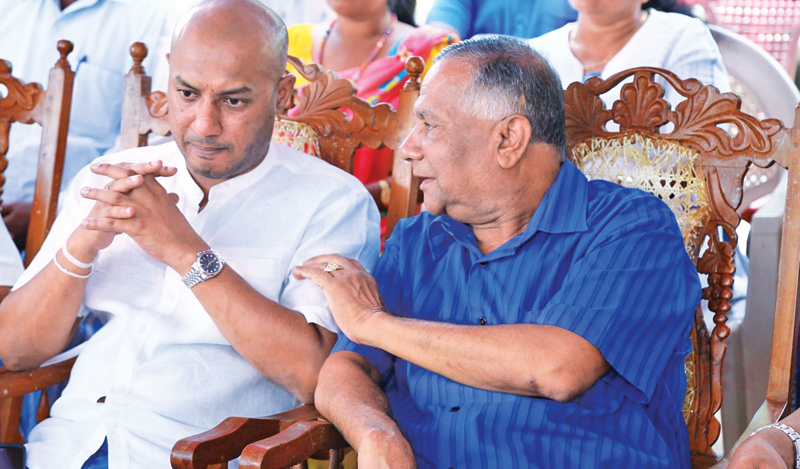 Politician Kumara Welgama recently said that his colleagues opposed the idea of a retired army officer governing the county, and that a person not even elected to a Pradesiya Sabha would be unfit to contest the Presidential elections. United People's Freedom Alliance (UPFA) Parliamentarian Vasudeva Nanayakkara had the same view. Former President Mahinda Rajapaksa would require at least one of his kith or kin to become the next President in order to whitewash his crimes, the minister said. ''The former President has not changed his ways. We witnessed this in his words against his private secretary Udith Lokubandara, recently," he said, adding that Rajapaksa and President Maithripala Sirisena were polar opposites with regard to social, political and economical vision.